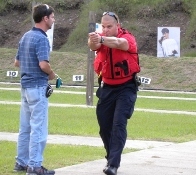 Daytona Beach’s Citizens Police Academy is a very popular community outreach program. The course of instruction is a perfect way for residents to become familiar with the basic functions of their police department and learn about the training our officers receive. An off-site field trip to a shooting range where academy participants can test their marksmanship skills. The next opportunity to get an inside look at our police department is Tuesday, September 5, from 6 to 8:30 p.m. at Police Headquarters, 129 Valor Boulevard in Daytona Beach. There is no cost for the ten-week program, which will be every Tuesday evening through November 14. There is absolutely no experience necessary to partake in the activities – just an investment of time and an interest in learning about our police department. To register, please contact Nick Fiore at (386) 671-5291 or by email.